(James J. Lee/Staff) While the area around Kajaki Dam is picturesque, it's also dangerous. CAMP LEATHERNECK, Afghanistan — Good morning, friends. Photographer James Lee and I made it back early this morning to this forward operating base, the main hub of Marine operations in southern Afghanistan. That means we’re finished with patrols on this trip. I’d like to thank the personnel with 1st Battalion, 8th Marines, out of Camp Lejeune, N.C.; and 1st Battalion, 7th Marines, out of Twentynine Palms, Calif. They hosted us along the way in Kajaki and Sangin districts, respectively, sharing their worlds in some of the most dangerous areas Marines patrol. For those who have been following along on this blog during our trip, I wanted to point out that Marine Corps Times has posted online our story about Forward Operating Base Zeebrugge, the cliffside base used to defend the landmark Kajaki Dam in Afghanistan. As the story points out, artillerymen with Golf Battery, 2nd Battalion, 11th Marines, spent the better part of their deployment serving as provisional infantrymen in the region, defending the dam and the surrounding area. One of the fascinating parts about the dam is its varied history. Russian, British and U.S. forces all have served there, a fact that highlights the many years of conflict in Afghanistan. Every time you see something like this, it makes you realize this place used to be nice,” said the platoon sergeant with Golf Battery, standing on one of the cliffs overlooking the dam’s spillway. Local folklore holds that Soviet troops were trapped and killed by mujahedeen fighters in one of Zeebrugge’s buildings. I couldn’t verify that story, but observed that the building’s hallways are pockmarked with bullet holes. 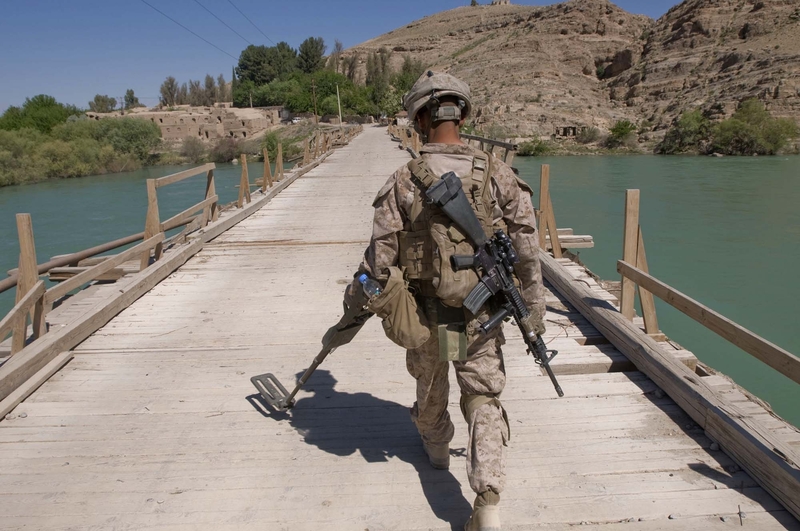 The facility, now known as “Militia House,” houses Afghan soldiers partnered with Marines. You are in prayers ! I’m kind of bummed you didn’t spend much time with 1/7, but I know you have a job to do. Thank you for what you did share with us here in the states. It was greatly appreciated! God bless you Dan and James and all our Marines out there. Thanks, Codysmom. I also wish we could have spent more time with 1/7, but some logistical hiccups with helicopter flights prevented that. We’ll have more to come on the blog over the next few days. Dan and James. Thank You for the reports from the field. Our son will deploy with the 2/7 of TwntyNine Palms this coming October. Helpfull to get a “feel” for the region. Most importantly…THANK YOU to all of our MARINES and Service Personell for what You do!!! Thank you for your blog posts on the 1/7. Hello to the other families of 1/7 guys! To #4 Gary Sosnowski, you think it is very smart to post when the next unit is coming in?